Escape to a romantic getaway in this charming turn-of-the-century Victorian Inn. Lace curtains and hardwood floors adorn antique filled rooms. Towering pecan and oak trees shade verandas with rockers to watch the passing horse-drawn buggies, or you may relax by the fountain in our courtyard. Amenities include full gourmet breakfast, hors d' oeuvres, jacuzzi, cable TV, on-site parking, bicycles, special packages and weddings, owner hospitality. Featured in West Palm Beach Post, Orlando Magazine, Foders, Frommers, Best Places to Stay in Florida and many others. Located in the heart of the historic district in the Oldest City in the Nation. 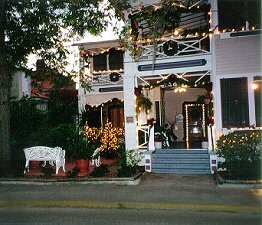 The Old Powder House Inn Bed & Breakfast "Where Beautiful Memories Are Made".